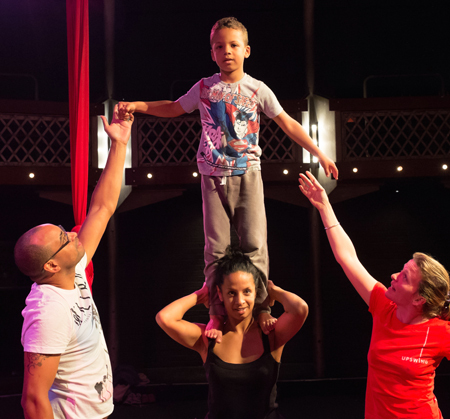 An interactive and immersive circus theatre performance for families with young children. Created specifically for Word2016, this accessible and fun family activity draws inspiration from Upswing’s critically acclaimed show Bedtime Stories. A soft play area of mattresses, pillows, quilts and soft toys, reminiscent of a child’s bedroom set the scene for an adventurous journey into acrobatics and storytelling. Families will be invited to take off their shoes and learn tricks and games with the two characters show the before getting into bed and taking part in a magical adventure through the library stacks.